I’m thrilled to feature Anna-Marie McLemore’s THE WEIGHT OF FEATHERS on the blog today and to give away a pre-order to one lucky winner! Anna-Marie and I were teammates in the first-ever The Writer’s Voice contest in 2012 (Team Krista), and we’ve stayed in touch ever since–which is why I was able to get in on an ARC tour for the book and read it early :). The book comes out Sept. 15, and I will definitely be adding it to my permanent collection! Here’s the gorgeous cover and description. 1. The title – This may seem like a strange thing to love, but sometimes I read a whole novel and never figure out where the title originated. For this book, the title showed up on page two, and it completely grounded me in the story. Titles aren’t always powerful, but this one is. 2. The blend of magic and science – On the surface, this story is one of magic–not spells and transformations but an old, intrinsic magic that permeates these families. But at the same time, sciences plays an important role, and the two are woven together in a way I found quite fascinating as the story progressed. It’s unique and masterful. 3. The distinct voices – The story mostly alternates between Lace and Cluck, occasionally staying with one character for a couple of chapters. I loved how distinct the voices are. I wish I could share an example, but the scenes that I felt best exemplified this are quite long. It’s when each of them describe the other’s show. Lace goes into much more detail than Cluck, is more complimentary, and yet you still understand how much Cluck appreciates the mermaid show. Very well done. 4. The romance – I loved Lace and Cluck’s dialogue and wordplay, and if I hadn’t passed the ARC along to someone else, I would have found a passage to share for this :). But I also loved how the feelings built differently on each side, particularly as they each learn the other’s true identity at different points in the story. Imagine falling in love with someone and discovering later they’re your enemy versus knowing from the beginning they’re forbidden. I get shivers just remembering it! 5. The languages – I loved how seamlessly Anna-Marie wove in French and Spanish. Often the words were translated in an easy way, but sometimes they weren’t and it was entirely appropriate. There was a moment with Cluck’s mother where Lace said she must not have wanted her to know what she’d said since she didn’t translate. I never felt like the translations interrupted the flow of the narrative, and that’s quite an accomplishment. I so love this book that I want to put it in someone else’s hands as soon as it’s available (remember, that’s Sept. 15!). As a result, I’m giving away a pre-order to one lucky winner. North America only, please. Click on the link below to enter. 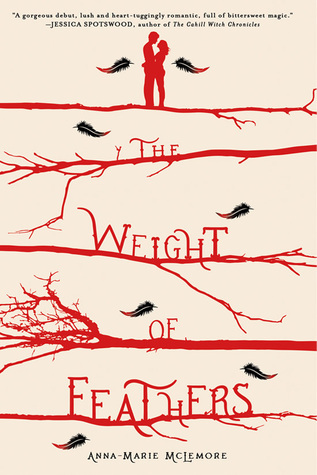 Click here to enter the giveaway for THE WEIGHT OF FEATHERS! And come back next week, as I’m planning another giveaway. I know! Two in a row :)! As a writer, I get a lot of books recommended to me during the critique process for various reasons. Sometimes it’s because the author uses a similar technique, others for a similar premise or plot point. Discovering new authors is a great side benefit of the critique process. I’m not sure I would have heard about this one or picked it up on my own otherwise. So, thank you to Melanie Conklin for directing me to Sherry Thomas and THE BURNING SKY! Here the five things I loved most. 1. The footnotes – I loved the way Ms. Thomas used reference texts from within the world to provide background. My only caveat was that I wished the footnotes had been on the actual pages instead of having to flip to the back of the book, but they were long footnotes, so I can see why the publisher decided to do it that way. 2. The new twist on an old story – Is it a Chosen One story or not? With the prophesy, it certainly sounds like a Chosen One story, but it’s not that simple, and the question of how much control they have over fate becomes central to the story. I’m interested to see how it plays out in the rest of the series. 3. The romance – I was a little nervous going in about a romance author switching to young adult, but Ms. Thomas handled it very well. It had just the right amount of adolescent tension, particularly for the first book in a series. And I love Titus, with the multiple faces he puts on depending on his audience! 4. The magical elements – I liked they way Ms. Thomas pulled in a number of magical elements that seemed familiar from existing stories and still introduced new concepts. It made the world easy to relate to and yet offered more to discover. I think this is a hard balance to achieve. 5. The enemy – The Bane remained a complete mystery to me at the end of the book, and that was kind of amazing considering it was a hefty novel. Quite a lot happened. I think that’s because one of his underlings was the more immediate threat, so now I’m hooked and intrigued about this villain and what is in store for Titus and Iolanthe in the next book. Have you read THE BURNING SKY? Are you anxiously awaiting the next book in the series? Are there any authors you’ve discovered thanks to a recommendation from a critique partner or beta reader?